CrossRoads: A Southern Culture Annual is a publication dedicated to the interdisciplinary study and artistic appreciation of the South (broadly defined) and Southern culture. Published annually, CrossRoads continues the editorial approach of CrossRoads: A Journal of Southern Culture, a semi-legendary periodical originally published in the early 1990s by a dedicated group of graduate students affiliated with the University of Mississippi’s Center for the Study of Southern Culture. 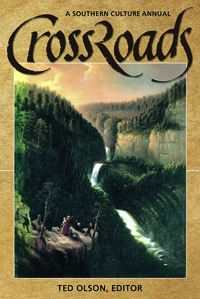 The original periodical of CrossRoads featured previously unpublished material by many of the leading scholars and artists committed to interpreting and celebrating the South, including Rob Amberg, A. R. Ammons, Mary Ulmer Chiltosky, Jim Clark, James Dickey, Robert Drake, William Ferris, Ann Fisher-Wirth, Wayne Flynt, Ernest Gaines, David Galef, Eugene Genovese, Kathryn Gurkin, Alex Haley, Fred Hobson, David Huddle, Patricia Spears Jones, Jack Temple Kirby, Jeff Daniel Marion, Ed McClanahan, Walter McDonald, Ethelbert Miller, Robert Morgan, Marilyn Nance, Tom Rankin, John Shelton Reed, Sheryl St. Germain, Jon Michael Spencer, Joel Williamson, and Steve Young. This first volume of CrossRoads: A Southern Culture Annual, features new work by such scholars and artists as Kimberly Greene Angle, Ruth Knight Bailey, Brooks Blevins, Henry A. Buchanan, James E. Cherry, Mariea Caudill Dennison, G. Wayne Dowdy, Jo Angela Edwins, Bart Galloway, Allean Hale, M. Thomas Inge, Theresa Lloyd, Dorothy Hampton Marcus, Robert Morgan, Mendi Lewis Obadike, Kevin E. O’Donnell, James A. Perkins, Ron Rash, Randy Rudder, Jean-Mark Sens, Charles D. Thompson Jr., Jaclyn Weldon White, and Brenda Witchger.